As infrastructure needs grow across the U.S., asphalt contractors need the best tools to meet demand head-on. Purchasing an asphalt plant is a great way to ensure a contractor is self-dependent. It’s also a big financial commitment so it’s important to carefully think through the selection. Portable plants cost more than stationary plants but offer suppliers the ability to easily move from job to job, allowing them to make up the difference with the ROI that comes from having more work. Tonnage: Match the size of the plant to output requirements. New asphalt plant owners often overbuy, only considering their highest production days. Be careful to analyze the local market to determine how much capacity will be needed daily as well as factoring in potential growth from outside sales. Counterflow or parallel flow: The decision of whether to go with a counterflow or parallel flow plant usually depends on the plant location and permitting requirements. Parallel systems cost less but have higher emissions and may not be allowed in some areas, particularly in the U.S. and Canada, without add-on components, such as a blue smoke system and condenser. Counterflow drum mixer plants, a more efficient option, offer the ability to use higher percentages of RAP while minimizing emissions. Permitting: The permitting process can take as long as 2 years, so it’s important to start applying as early as possible. The type of permit depends entirely on state and local requirements for the plant location. Keep in mind that portable plants are generally easier to get permits for than stationary because they are only temporary. Manufacturer Support: The type and size of components included in the finished plant will depend on the style and capacity of the system chosen. Look for a manufacturer that offers common parts that can be found locally or that can be delivered quickly to the site to minimize downtime spent waiting for repairs. Asphalt plant manufacturers are a great resource for guidance in choosing the best system for an operation. 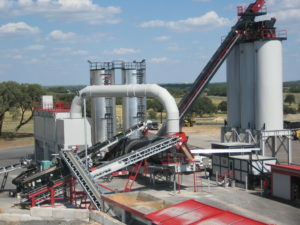 Buying a used asphalt plant from someone other than a manufacturer saves money in the short term but could end up being a costly mistake due to unfamiliar and worn equipment not tailored to the operation. Choose a manufacturer that will assess the situation and build a plant specific to a supplier’s needs and future growth, ensuring maximum ROI.